It was fun to be back among the Maui Pink Cap Swimmers to help celebrate Doug's 34th (or some multiple thereof) Birthday. 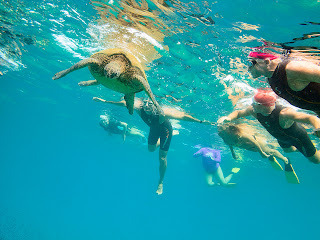 We visited with lots of friendly Sea Turtles along the way, and even some curious SCUBA divers. Thanks for the fun times everybody and especially to Christine for the delicious brunch afterward.